Welcome to the Photo Gallery Spotlight. Each month we’ll showcase a particularly nice aquarium photograph, taking the time to discuss the identification and husbandry of the animal pictured as well as information relating to the technical details of how the photo was taken. Readers are encouraged to send images (and details on the organisms pictured, as well as the details of how they captured the shot) they would like to submit for possible inclusion in this feature to terry@advancedaquarist.com . For submissions that are published in Advanced Aquarist, the author will receive a $25.00 gift certificate from one of our participating advertisers. The little star arrived in my tank as a hitchhiker on a Purple Sea Plume, Pseudopterogorgia sp. just over 10 months ago. I feed it directly every night with a pipette, its favorite snack is small pieces of krill. I believe that it has probably doubled in size whilst in my tank and has only moved position once on its gorgonian home. I assume the move was prompted by its increased size. 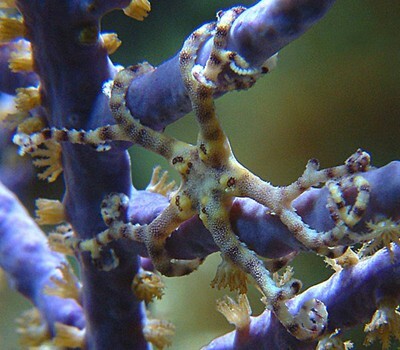 During the day it spends its time tightly curled around a couple of branches of the gorgonian and at night its arms are spread wide in the typical basket star feeding pattern. It recently had a near death experience in the jaws of my Scarlet Hawkfish who plucked it right off of its gorgonian home whilst trying to steal the piece of food that I had just offered the star. Interestingly, the star apparently didn’t taste very nice or something because the fish spat it out again almost immediately, much to my (and no doubt the stars) very great relief. The stranded basket star crawled back on toits gorgonian with incredible speed when I offered it a branch minutes later.